The V-Class is the undisputed leader in the luxury minibus segment. Mercedes V-Class hire is intended for professionals who simply want to work with the best. Mercedes was already at the top of the luxury minivan market with its Viano model. The V-Class has a touch of genius (and artistry) that has propelled it into the highest spot as the undisputed leader in top-of-the-line people transport. Its accomplished design and characteristic lines make it similar to luxury Mercedes-Benz saloons. For the V-Class's design, Mercedes has created an elegant interior concept centred around an impressive driver's cabin in a modern style. The vehicle's high-end, refined materials include Lugano leather upholstery, making the cabin a luxurious space that's difficult to leave! In back, the seating design is very flexible, featuring everything from six-passenger people carriers to eight-passenger minibuses in standard or lounge configuration. If requested the day prior to your hire, we can configure your Mercedes V-Class's interior space according to your preferences for an unparalleled level of passenger comfort. Each seat is independent and can be individually adjusted so every passenger can feel their best. We-Van's fleet of Mercedes-Benz V-Class vehicles exclusively features extra-long wheel-base models so clients have the maximum amount of storage space and volume. At the same time, the V-Class's balanced dimensions ensure minimum obstruction and provide a driving experience that combines agility and comfort. Its small turning radius allows the vehicle to easily manoeuvre in tight conditions and its low height means you have the luxury of accessing underground parking structures while in town (h < 1.90m). 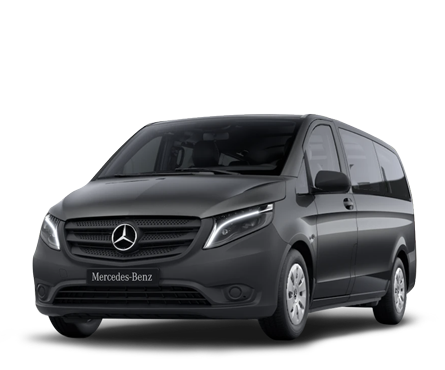 And since hiring a Mercedes V-Class is the ideal solution for passenger transport professionals, all our minivans in this category come in black paint with tinted windows, two sliding side doors, and the famous 7G-Tronic Plus automatic gearbox. We hired a Mercedes V-Class that was practically new (1 month, 8000km) and well-equipped (GPS, leather interior, automatic gearbox, and extra-long version where we had no issues fitting 8 people and all our luggage).